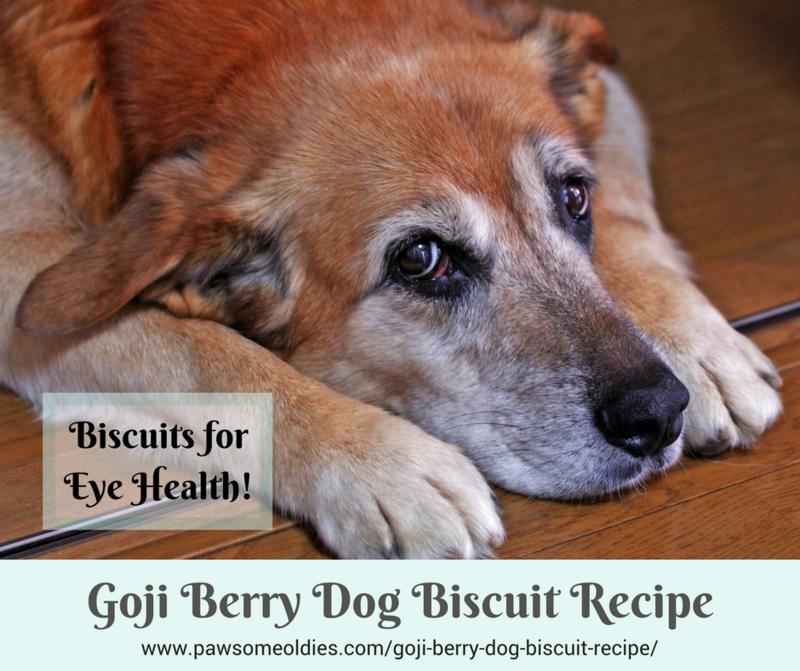 This goji berry dog biscuit recipe is easy to make, very palatable (according to my dog who gave this biscuit her 4-paw seal of approval), and the biscuits are in fact good for dog eye health. Goji berries are sweet and incorporate well in healthy dog biscuits. They are also nutrient-packed. In addition to goji berries, this recipe uses other natural ingredients such as coconut flakes, flaxseed meal, honey, and cinnamon, making the biscuit sweet and tasty. 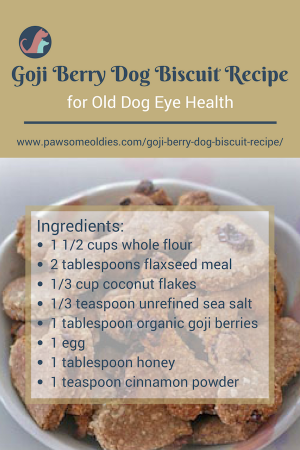 This goji berry dog biscuit recipe is low in fat, high in dietary fiber and protein, vitamin B6, and trace minerals (e.g. calcium, potassium, iron, and selenium). Goji berries have long been used by the Chinese and Tibetan people for years to support their eyesight, immune system, and general well-being. A total of 18 amino acids. Vitamins A, B (B1, B2, and B6), C, and E.
Dietary minerals (such as calcium, potassium, iron, zinc, selenium). Carotenoids (thus the bright red color) including beta-carotene, lutein, zeaxanthin, and lycopene. Essential fatty acids, including linoleic acid and alpha-linolenic acid. The antioxidants found in goji berries (in particular beta-carotene, zeaxanthin and lutein) are known to be good for eye health. They lower the risk of developing age-related eye problems such as macular degeneration. The high EFA contents are good for maintaining brain and nerve health. The berries are nutrient-rich as they have high protein, vitamin, and mineral contents. The polysaccharides in goji berries are unique in that they work in sync to fortify the immune system. In other words, goji berries support the immunity and may have anti-aging functions. Are Goji Berries Safe for Dogs? There is a lot of conflicting information on the Internet about the safety of goji berries on dogs. In situations like this, I always go to the “authority” – find a source that is reliable. After much searching, I found confirmation from Dr. Brown, a specialist in the toxicology area at the Cornell University Veterinary School, that goji berries are not a problem for dogs! Since goji berries are high in sugar levels, it may not be a good idea to give them to dogs with blood sugar problems (e.g. diabetes). Goji berries may have blood-thinning effects, so do not give them to dogs who are going to have surgeries. Goji berries are found to have adverse interactions with some drugs (e.g. warfarin, drugs for diabetes); therefore, check with a holistic vet first if your dog is on medication. Some goji berries imported from China may have high levels of pesticides and insecticides, so be sure to use organic berries. Preheat oven to 325°F (160°C) and line a baking sheet with parchment paper. In a large bowl, mix all the dry ingredients except the goji berries. In another bowl, mix all the wet ingredients. Fold in the goji berries. Knead a few times to make a dough. Add water, a tablespoon at a time, if the dough is too dry. Let the dough sit at room temperature for about 15 minutes. Put the dough between 2 sheets of saran wrap and roll out to about 1/4″ thick. Use a cookie cutter to cut out desired shapes. Put cut-out biscuits onto the baking sheet and bake in preheated oven for about 15 minutes. Take the biscuits out and turn them over. Return biscuits to oven and bake for another 5 minutes. To harden the biscuits more, leave them in oven until cool. Goji berries puff up a bit when heated and, because of their sugar content, burn easily, so watch the biscuits carefully. PawsomeOldies.com © 2017-2019. All Rights Reserved.